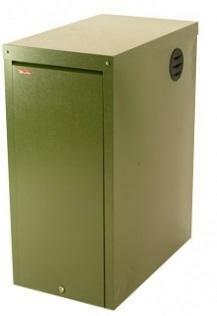 The Kabin Pak HE is an oil system boiler with an output of 21kW. This boiler comes with a pre-wired factory-fitted burner, thermostat, and a circulating pump. It also comes with a IEC320 mains socket that will need to be wired on site. It is flexible as to where it can be positioned, with a multi-optional low level flue exhaust that can be positioned at the back left or right of the casing. It also comes with a pre assembled expansion vessel, pressure gauge and filling loop. This model is quick to install, as the system kit can be connected in only a few minutes. Within these few minutes it is able to create a sealed heating system. Its 900mm height 413mm width and 700mm depth mean it is a compact and neat boiler. The Kabin Pak HE is an easy to use A rated boiler with a five year guarantee. It also comes available in outputs of 26kW and 33kW.